Lt. Governor Chin kicked off the Hawaii Foodbank’s Annual State Food Drive on February 21, 2018. The Food Drive ran from March 17 – May 19, 2018. 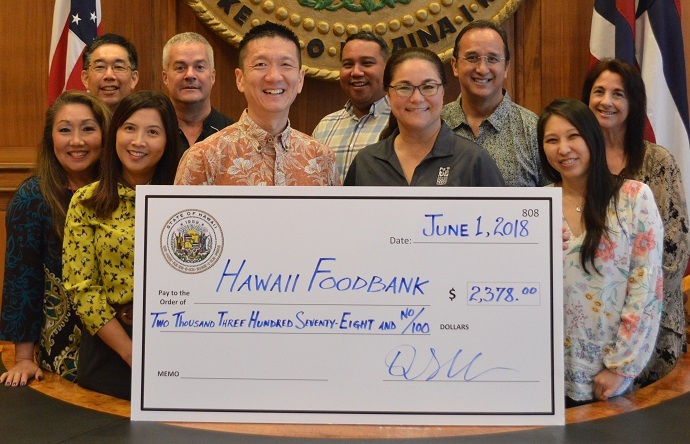 In support of the Food Drive, the Lieutenant Governor’s Office and Chef Greg Christian of Beyond Green Partners raised $2,378.00 for the Hawaii Foodbank through its spaghetti plate fundraiser. The fundraiser was held on April 26, 2018 and featured food donated and cooked by Chef Greg, including spaghetti with pork and beef meatballs, garlic bread, Caesar salad with homemade dressing, and homemade chocolate chip cookies prepared by Marnie Record, also of Beyond Green Partners. Accepting the check on behalf of the Hawaii Foodbank were Ron Mizutani, President and CEO and Laura Kay Rand, VP & Chief Impact Officer. Mahalo to all those who sold tickets or purchased spaghetti plates in support of the fundraiser! 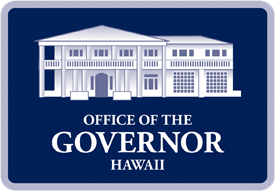 Beyond Green Partners is an integral partner of the Office of the Lieutenant Governor on the ʻAina Pono Hawaii State Farm to School Program. 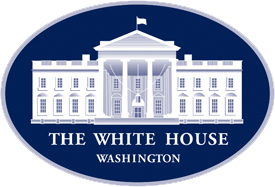 More information about the program can be found here.